Boerengroep brings you to the field! In the Netherlands, and Europe in general, policy advice and research is often disconnected from the reality of farmers, gardeners and peasants. On the one hand the knowledge of farmers is not valorised, on the other hand the knowledge produced at educational institutes is often too abstract, creating gaps between farmers’ needs and research. Within Wageningen University, many students of agriculture-related topics have no experience with farms or farming and are not aware what is happening in the field. Students, destined for a future career as researcher, policy maker, entrepreneur or farmer will benefit from a more qualified professional education if they understand and experience the daily reality of a farm. Boerengroep offers year-round excursions and a summer course (FEI) to offer students the opportunity to put things into practice! Everyone is welcome to join for excursions (no knowledge or experience required), subscribe by filling in the subscription form that you can find underneath an excursion. Do you want to organise an excursion to a farm or garden? Contact us! This autumn Boerengroep will organise three Autumn excursions again! 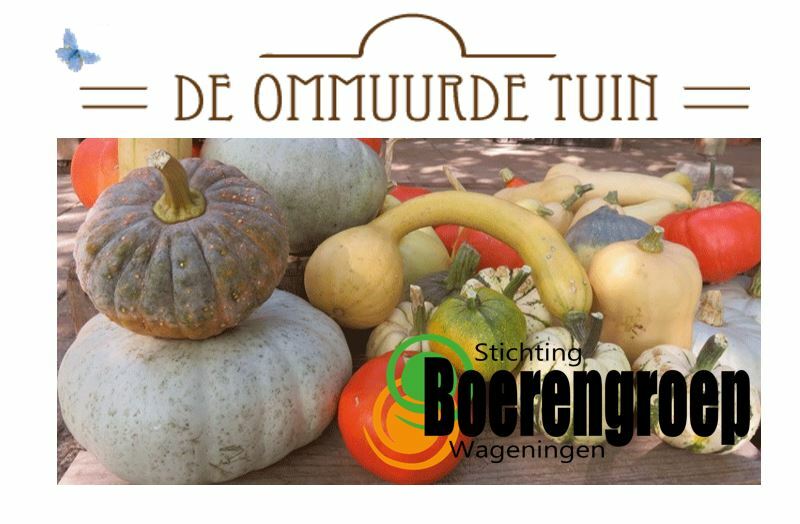 The first is a bike excursion to the organic garden ‘de Ommuurde tuin’ on the 22nd of september. Keep an eye on this website to stay updated about the other two! Register BEFORE SEPTEMBER 20th to join this excursion! De Ommuurde Tuin is located in Renkum and is the former garden of the wife of King Willem the Third. For the last 20 years, Esther Kuiler has been restoring the garden and it is a beauty! She grows over 400 varieties of plants on a little over 1 hectare of land. On the 22nd f September, we will gather on WUR campus (at the ground floor in FORUM building) at 10:30. After a short introduction about Boerengroep and De Ommuurde Tuin, we will bike to the garden in Renkum, which takes about 20/ 25 minutes. We will be back on Campus around 14:00. This excursion includes a tour through the garden in English given by Elske, one of the gardeners. Elske can tell all about the garden, where they grow more than 400 varieties of fruits, herbs and vegetables and she will share what it is like to be a small farmer in the Netherlands and what kind of challenges they are facing. Off course you are able to ask her questions! Furthermore, you can walk around in the garden freely, buy and/or eat their products and take part in the ‘harvest fest activities’ that takes place this day. If you want to join this excursion, please register BEFORE 20th OF SEPTEMBER by filling in the goolge form (see link at the bottom of this page). The fee of €3,- should be paid simultaneously by online bank transfer to Boerengroep: NL20TRIO 0390517992.
p.s. Boerengroep foundation does not make any profit with excursions, most of the fee is given to the farmer. If you register but don’t show up at the excursion, you will not get a refund. Don’t forget to bring your bike, since it is a bike excursion! !